Nestled in Southern Utah, St. George is the golf capital of Utah. Golf courses in St. George and the surrounding areas are like none other with their rolling hills of lush green paired with the deep red of the canyon rocks. Experiencing pleasant weather year round and landscapes like you’ve never seen before, St. George and the surrounding areas offer the most unique and scenic setting for a game or two of golf. Even if you are not an avid golfer, these courses offer spectacular one-of-a kind views that everyone can enjoy. There are both public and private courses scattered across Southern Utah. One of the most popular locations for golfing is the Red Rock Golf Trail in St. George. Red Rock Trail features several remarkable courses that include: Sunbrook, Sky Mountain, Coral Canyon, Sun River, Falcon Ride, and Sand Hollow. Beyond Red Rock Golf Trail, there are several other golf clubs and resorts, all with their own unique offerings. Sunbrook Golf Club includes 27 championship holes and three 9-hole courses: Black Rock, Woodbridge, and the Pointe. Each hole on these courses has something a little unique about it, from holes carved from the rock of lava to holes bordering 100 foot cliffs off into the desert. Sunbrook is rated among the top courses in the state of Utah. Southgate Golf Club is tucked in the rolling hills of St. George with the Santa Clara River running through portions of the course. This features 6,100 yards of green with two unique nines. Southgate is great for golfers who want a little water related challenge on the course. Dixie Red Hills has been around for more than 40 years. This course is quite well known and features a 9-hole course with 34 layouts. Golfers can even enjoy some nice moments of shade beneath the Mondale Pines and Cottonwoods that are on the course. Lake Powell National Golf Course features 18 championship holes overlooking the Glen Canyon Dam as well Lake Powell. This course offers breathtaking views and a scenic layout that is ideal for any golfer. Whether you go to Sunbrook or Red Rock or any of the other courses and resorts in between, all golfers of all skill levels will find that golfing in Southern Utah is simply unique and irreplaceable. Mild weather, beautiful backdrops, and a challenging geography make for some of the best courses in the world. One of the many things we love about St. George is all of the history that our charming little city has right in the heart of downtown St. George. Locals and tourists alike have the opportunity to visit some of the most beautiful and historic buildings in the west. There is so much that can be learned when visiting any of these sites, whether one is interested in religion, architecture, woodwork, photography, or all of them, you will definitely enjoy the tours and be glad you did not skip out! St. George was originally settled by 309 families that were called to establish the area under the direction of Brigham Young in 1861 as a cotton mission. This area was named after an Apostle of The Church of Jesus Christ of Latter Day Saints, George A. Smith. The early settlers did in fact grow cotton to be self-sufficient during the time of the American Civil War, but never in the competitive market. 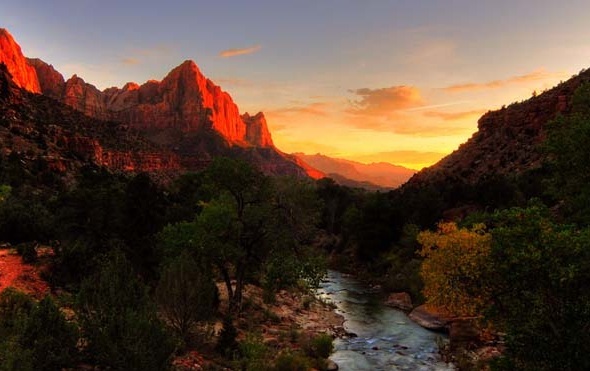 One can often hear St. George being referred to as “Utah’s Dixie” for that very reason. The St. George, Utah Temple was completed in 1877 and was specifically designed to sit in the center of town. It was the first completed temple in Utah and is currently still in operation for the members of The Church of Jesus Christ of Latter Day Saints. There is a Visitors Center on the temple grounds also available to the public to visit and tour. The Brigham Young Winter Home is a historic residence that was built in 1871 and is now currently open to the public as a museum. The early settlers built the home for Brigham young, who at the time was the President of The Church of Jesus Christ of Latter Day Saints. Much of the home was built using many of the common resources that are found in the area and other nearby places, such as the sandstone, wood from the Pine Valley Mountain Wilderness, and not to mention most of the furniture in the home built by Brigham Young himself. It is a beautiful home and it is popular among many local photographers for photography sessions. The St. George, Utah Tabernacle is yet another popular historic building to visit downtown. The Tabernacle was originally built to be the city’s public works building, to host court hearings, hold church services, and other public events. It was completed in 1876 and was nicknamed “jewel of the desert.” It is still open today to tour and it continues to hold a number of different community events. When visiting any or all of these buildings, enjoy all of the beautiful detail that was done by hand by the early settlers of St. George. It is incredible to see such amazing buildings still in working order after over one hundred thirty years ago. Book your stay at one of our luxurious St. George vacation rentals, and enjoy a fantastic summer exploring one-of-a-kind St. George, Utah. Let’s face it. With the amount of uncertainties that life offers today, it’s almost impossible to avoid stress. There’s a myriad of causes of stress today, and there’s only so much that can relieve that stress. It’s actually medical fact that regular vacations (large or small) can drastically decrease the amount of stress in your life and even lower your risk of heart disease. We didn’t make that up. Spending a week or two, or even a few days, away from your workplace and other areas of stress can help you to relax your mind and body. From experience, whenever I’ve taken a vacation – making sure priorities are taken care of before I leave – things start to clear up. My perspective on certain things changes. My attitude changes. I smile and laugh more. Most importantly, I feel happier and ready for new challenges. All of that comes from taking a few days away from emails and escaping to somewhere I can relax. Sunshine is always good during a vacation. It improves your mood and is known to fend off depression. St. George is full of sunshine all year long. When it’s snowing up in Salt Lake, the palm tree are glowing down in St. George. We’re full of vitamin D down here in Southern Utah. Some people show up at our St. George vacation rentals a bit flustered and impatient. 2 days later, those same people are relaxed, smiling, and enjoying life. I love seeing that!